On the waters edge of the Taipa Estuary is this stunning recently refurbished property that can accommodate four families or 20 guests! In a former life the property was a motel but has been carefully and lovingly updated and remodelled to make it a fantastic holiday house property. Four bedrooms and a full kitchen up-stairs and two totally self contained 2 bedroom units downstairs. The three units are all under the same roof but are totally self sufficient - you can have company when you want but head home to your own pad when you want a bit of quiet! All units come with SKY TV , IPOD docking , CD and DVD player. Beautiful grounds surround the house and a flat park like lawn takes you down to the water. You can swim at all tides right in front of the house. All apartments are tastefully decorated, very comfortable and are light, bright and funky. Every detail has been thought of in these apartments for a family stay and all linen is provided with your let. All you need to do is get here and let the holiday fun begin. If adventure is your thing, then Cabrel Sea is perfect for you. With the boat ramp 300m away. 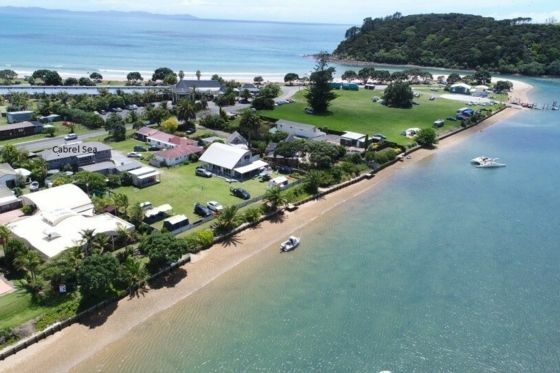 Head up the river for the Taipa ski lane area or into the Bay with big snaps, kingies, crays and scallops only minutes away, with the famous Garden patch for game fishing. Prices include GST,linen and towels. Cleaning is included in price however guests are asked to leave house in tidy condition and take all rubbish with them. Prices vary for public holidays so if you stay includes a public holiday then please ask for a quote. What a wonderful place to stay, as soon as we walked in we felt very welcomed. The three units were very nicely decorated and clean. Had a thoroughly enjoyable time, with some good places to go, and the convenience of shops just down the road, . Would definitely look at going to stay in Cabrel Sea again in the future. This property was very clean and tidy on arrival. This property was very clean and tidy on arrival. Just close enough and convenient to local amenties. This is the perfect place for a family holiday. This is the perfect place for a family holiday. Excellent location, excellent property, and everything you need to make your stay an enjoyable one. I would recommend this property to all. The Cabrel Sea was perfect for our 4 families. The Cabrel Sea was perfect for our 4 families. There was loads of space and the rooms were spacious and lovely. The linen was very nice and the kitchen well appointed. The outdoor furniture was to a high standard. Everything made did a very easy relaxing holiday - couldn't fault it! The apartments were beautiful! Amazingly clean and fully fitted with anything you could ever need. The apartments were beautiful! Amazingly clean and fully fitted with anything you could ever need. So close to the beach and shops too. We had a fabulous stay and I couldn't recommend it highly enough.